After a discussion with the president of the chess club, the president plan that buy 5 sets of the shogi set for the club. So at the end the parcel arrive during 8 July, there are totally 6 sets of them. One of them is bought by my friend, as he requested before. But unfortunately, I never thinking of investment on the small shogi. Since I want to promote the shogi, I should also thinking of those peoples that interest in buying the shogi. 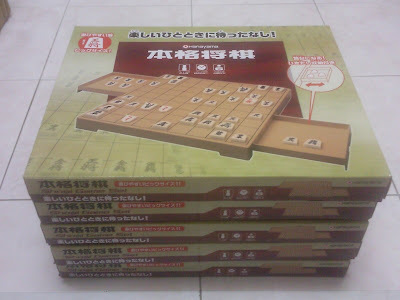 The big set of shogi costs about RM105 each. I don't think that the people got the money or the passion to buy that. So it will be better if I try to buy the small shogi set and resell to the others. First, I able to earn some profit for the chess club. Secondly, I indirectly promote the shogi in a faster way as when those people also promote the shogi to their other friends. Thirdly, if their friends is interest in the shogi, they will be interest to join the club, and also wish to buy the shogi set too. I never thought of that during the buying of the 6 big shogi set. However, I will try to request from the president of the chess club to try on the investment of the small shogi set.